Take care when you bite! 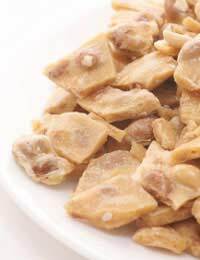 Sugar free nut brittle can be as hard on your teeth as the real thing - and delicious as it is, it isn’t worth losing your "gnashers" over! This traditionally British sweet works well with granulated sweetener instead of sugar. It is just as tasty - and just as crunchy as well.Make it with any nuts you like. You can be adventurous and try something luxurious, such as macadamia or brazil nuts, or you can go for the old favourite, and use peanuts. For this recipe you will need to roast your own nuts, or buy ready roasted. If you buy fresh peanuts for this recipe, you’ll need to shell and peel them before roasting them briefly under the grill. It is much easier, however, to do what this recipe suggests, and buy ready roasted peanuts and then rinse the salt off. Take your peanuts and rinse them in a bowl to wash off as much of the salt and oil as possible. Drain and dry on paper towel. Place your granulated sweetener, water and vinegar in a medium saucepan and stir over a low heat until dissolved. Bring to the bring and leave to bubble. Every so often take a small amount on the end of a tsp and drop into a glass of cold water. When the toffee sets hard, take your nuts (making sure they are dry by now) and tip them carefully into the hot liquid. Stir well. Pour the liquid into a greased fudge tin and leave to cool. Then place in the fridge over night. When almost set, it is worth scoring with a knife to make squares that can be more easily broken into pieces in the morning. This is a tasty recipe that makes a “Christmasy” nut brittle. For a delicious alternative try using brazil nuts instead of walnuts. Take half your walnuts and grind them in the blender. Place your sweetener, water and lemon juice in a small pan and melt over a low heat. Keep stirring until the liquid is smooth, then bring to the boil. Leave your pan bubbling gently. Every so often take a small amount on the end of a tsp and drop into a glass of cold water. Once your toffee mixture begins to set in the water, stir in your ground walnuts. Pour the liquid into a greased fudge tin. Take your remaining walnuts and arrange the halves on the surface of your nut brittle. Leave to cool. Place in the fridge over night. When almost set, it is worth scoring with a knife to make squares that can be more easily broken into pieces in the morning.